A NEW armed group that vowed to “execute” criminals in West and North Belfast has claimed responsibility for Monday’s shooting at the Grosvenor Homing Pigeon Club. The as-yet unnamed group, which is believed to have close ties to the INLA, said it shot two men in the Iveagh Street bar on Monday afternoon. There is no suggestion that the victims were guilty of any crimes. Two men with scarves pulled over their faces entered the Iveagh Street club and ordered the men to lie on the ground before shooting them in the legs. The pair were brought to the Royal Victoria Hospital where their conditions were described as stable. The gun attack is believed to be the first action taken by the group who last month exclusively revealed to the Andersonstown News that they were ready to start an assault on all those involved in criminality, including drug dealing and burglaries. Chillingly, the group asserted that the statement was not a warning “but a declaration of intent” and said that executions in West and North Belfast were “imminent”. While the group did not identify itself, it said it has operated in the community for many years and had “demonstrated our capabilities throughout decades of armed struggle”. 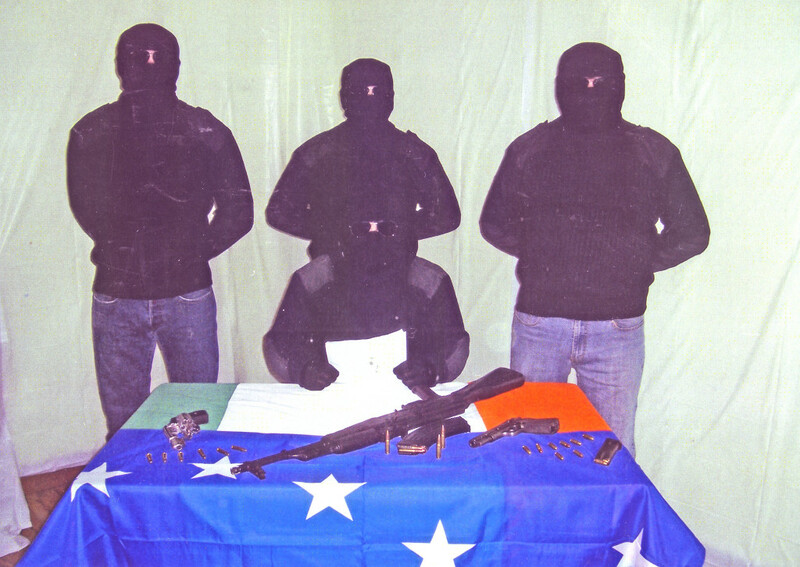 A photo accompanying last month’s statement showed members of the armed gang sitting behind a Starry Plough and tricolour with an assault rifle and two handguns in clear view. The group told us it was acting in response to community demands and has carried out an “extensive but carefully constructed plan of military action” in the West and North of the city and has drawn up a list of targets it intends to strike. “In response to the demands of working class communities throughout Belfast, particularly in the North and West of the city, we have concluded an extensive but carefully constructed plan of military action,” reads the statement. “There exists no justification for the violent activities of criminals and self-styled criminal gangs involved in a wide range of criminality including but not limited to muggings, burglaries, vicious assaults, drug dealing and the distribution of heroin with no consideration for the endless suffering endured by those we represent. Local politicians have condemned Monday’s shooting with Sinn Féin Councillor Ciarán Beattie describing the attack as “reckless”. “This shooting was totally wrong and I condemn it unreservedly,” he said. “It is absolutely reckless to go into a public bar in a busy area of West Belfast in the middle of the afternoon and shoot people. “Those responsible showed a complete disregard for the community by their actions and this incident could have been even worse. SDLP West Belfast MLA Alex Attwood echoed the condemnation. “This is the third time in two weeks that guns have been used on the streets of West Belfast,” he said. “Every attack is unjustified and the response to each and every attack must be unambiguous. People must provide information to the police.